I managed to be out and about quite a bit this weekend, often looking for birds though not finding a ton. On Friday I took the dogs for a long long walk along the Frenchman's Bar Trail in Vancouver. It wasn't too birdy but it was freakin gorgeous out. Anyway, this morning we walked out my front door and a raccoon was right there on the sidewalk. It catapulted itself into a tree immediately and I yanked the dogs back inside. He was a cutie. We waited for him to move on to a tree across the street before trying to leave again... The plan was to check out Baskett-Slough NWR down near Salem. I had only been there once before and didn't really know where to go. 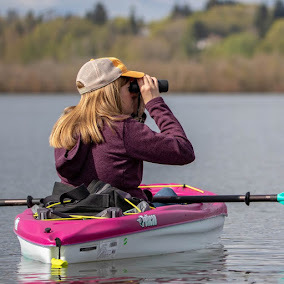 This time I was armed with Birding Oregon and feeling confident. At the main overlook was this bird... It's confusing me a bit... Is it just a female House Sparrow? The head looked so much browner than the ones I usually see outside my window. I went in search of the Acorn Woodpeckers at East Delta Park. I found where they were supposed to be right away. Unfortunately I had startled a flock of starlings right up into the same trees. That does not make things easy. I wandered around the area with the dogs checking all the trees nearby... On my way back I checked the first trees again and I found one of the woodpeckers right away! Woohoo! An Oregon first for me... I tried to find the second one but never did... I was happy to find one though! It was worth the numb fingers for sure. I had never even heard of an Acorn Woodpecker. It wasn't in any of my books so I googled it. What a great catch for you!!! Congrats on the Acorn. Not a species I've run into. Hopefully I'll visit your area in the next couple years. Clearly now I know where to go. Great that you got your Acorn!! That hawk shot is awesome! Looks like you had a great day out Jen. The Racoon shot is brill and those bandanas super cool - market them for pooches double quick. Congrats on the Acorn Woodpecker. You're pretty good at chasing birds!